Every day it feels like there is another headline about how impossible it is to buy a house or condo in Toronto. But have you tried renting lately? “The competition is fierce,” says real estate agent Dena Schiff, who works solely with clients looking for rentals. Open houses and bidding wars, she says, are now just part of the game. The cites the example of a recent listing in the Bay Street and Bloor Street West area for $1,800 a month. “It was pretty ridiculous,” said Schiff. Ridiculous, you’d think, considering all that construction downtown, right? Not quite, if you were to listen to Shaun Hildebrand, senior vice president for Urbanation, a real estate consulting firm. “The Toronto rental market is the strongest it’s been in three decades, and a lot of [it] has to do with what’s been happening in the ownership market,” said Hildebrand. It’s a sentiment borne out by data and echoed by real estate watchers interviewed by CBC Toronto. The number of condo apartments rented through the Multiple Listing Service (MLS) during 2016 in the Greater Toronto Area dropped two per cent to 26,602 units, according to January report released by the firm. That’s the first annual decline reported by Urbanation since it started monitoring the data in 2011. Condo rents rose 12 per cent in the fourth quarter of 2016 compared to the same period in 2015, with the average condo now renting for $30.80 per square metre ($2.77 per square foot), or $1,990 per month, says Urbanation. According to another analysis by the Toronto Real Estate Board, the average rate for a one-bedroom condo apartment listed on MLS in the fourth quarter of 2016 is $1,776, up 7.4 per cent from the previous year. That comes after successive year-over-year increases of 7.2 per cent, 6.4 per cent and 4.8 per cent for each of the previous three quarters. “The Toronto rental market is out of control,” said Geordie Dent, executive director of the Federation of Metro Tenants Associations. According to the Canada Mortgage and Housing Corporation’s 2016 data, the condo apartment vacancy rate is at one per cent — the lowest in seven years, the housing agency says. “And because of that, rents are shooting through the roof. You go to a showing in some parts of town, you’re going to have a lineup around the block,” Dent said. You’d think with all those cranes in the sky, supply wouldn’t be an issue. But once again, Hildebrand says, not quite. The majority of new builds in Toronto are condos. Last year 18,000 condo units completed construction, down from 19,700 in 2015, and 21,000 in 2014, according to Urbanation’s analysis. About 50 per cent of all new condo units are bought up by investors, who then turn them over to tenants. Hildebrand says what’s desperately needed is purpose-built rentals. Last year, just 1,700 rental units completed construction, he notes. And then there’s that fading dream of owning a home in the city. Stricter mortgage rules and skyrocketing home prices are keeping many millennials renting longer. “Prices are rising by 20 per cent year-over-year,” Hildebrand said. The mortgage rules boil down to a stress test for all insured mortgage applications. The test is to determine if a borrower could afford to pay back a loan if the rate was higher, so a borrower will be judged against the five-year standard rate of 4.64 per cent for a five-year loan, even though many lenders are currently offering mortgages at far less than that. Previously, that test was only used on certain segments of the market. But as of last October, it’s now in place for any insured mortgage for a buyer putting down less than 20 per cent of the home price up front. “Partly because it’s so difficult to buy a home now in the Toronto area, it’s forcing, perhaps, a lot of would-be buyers into the rental market — which makes the rental market even tighter,” said real estate lawyer Mark Weisleder. 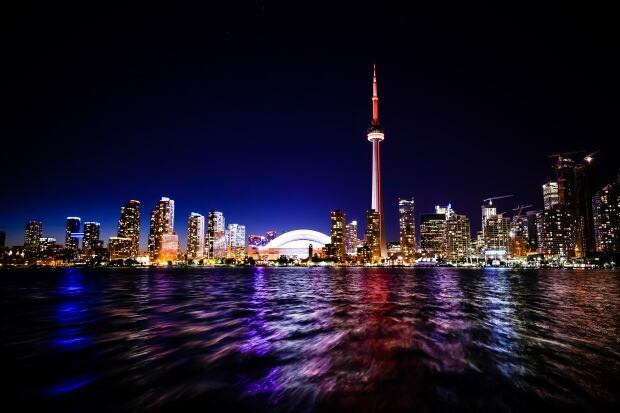 The secret’s out — Toronto’s a great place to live. “We’re seeing immigration levels to the GTA at 10-year highs, population growth in the core growing very quickly, and a robust job market as well that’s leading to stronger rates of household formation for the millennial generation,” said Hildebrand. That has driven demand for rentals, he says, to a 30-year high. 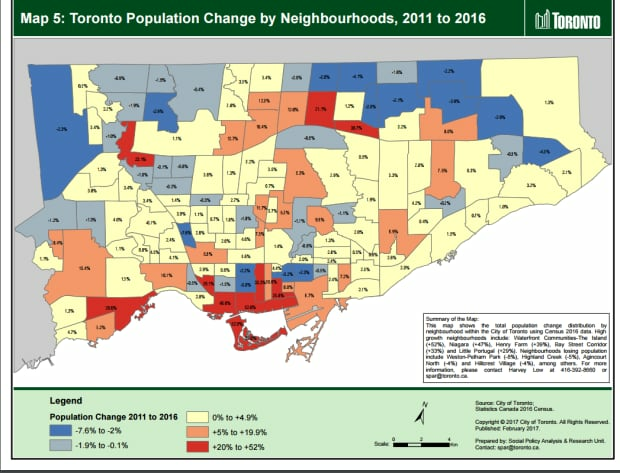 Census figures show the City of Toronto grew 4.4 per cent between 2011 and 2016. Nicole Meredith wants to know what the city’s decision-makers are doing to make rent in condo-apartments more reliable and stable. Her rent recently spiked $500/month. The Toronto Foundation’s recent vital signs report notes Toronto’s outsize growth since the start of the century, saying that growth between 2001 and 2014 in Toronto was equivalent to 87 per cent of the total population of Calgary in 2015. “Forty per cent of Toronto’s youth who moved here within the last five years did so for better opportunities,” the report says. But judging by the hundreds of young people who have written to us, many are still struggling to find an affordable place to call home. 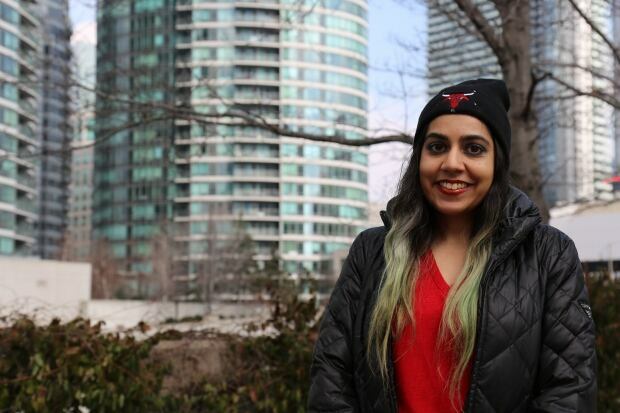 But finding an affordable place to call home when they get here is a real struggle, according to a number of young people who reached out to CBC Toronto with their stories. The majority of interest in residential properties comes from families, says a CBRE real estate expert. 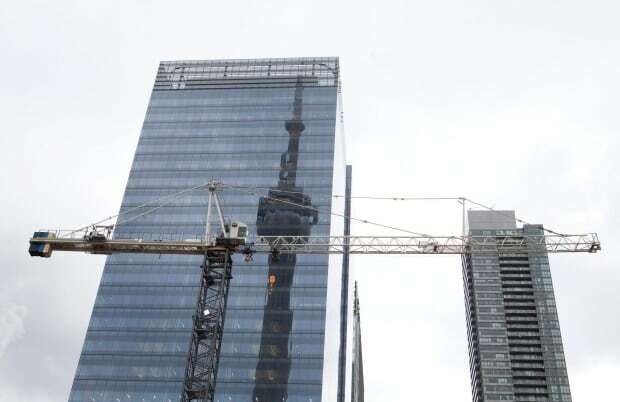 Toronto’s soaring home prices are in line with the reality of other world cities such as New York, Hong Kong and London, says Mark Renzoni, president of global commercial real estate giant CBRE. “The market is fairly balanced. It’s not being driven by foreign capital. It’s being driven by Canadians, moving up, buying for the first time,” he told the Star, following a speech at CBRE’s annual market forecast event. “There’s great jobs, there’s a sense of optimism, there’s confidence in the job market and interest rates are low,” said Renzoni, who suggested that concerns about foreign speculation in the Toronto housing market are overblown. “In Toronto, I would say the majority of foreign interest on residential, especially high rise. . . It’s families. They’ve got students in university here, they’ve got other relatives here, they’ve got one spouse here. They’re buying additional residential real estate because they believe in the investment grade quality of the product,” he said. “Even in a Canadian context, condominium pricing in Toronto is significantly lower than in Vancouver, significantly lower — discount lower — than New York or London. It’s still balanced and it still creates a great opportunity for people to create wealth and expand their horizons with investment. But also they’re buying for themselves. You have to live somewhere,” he said. “The marketplace here is really driven on fundamentals, which is supply and demand,” he said. He spoke to the Star following CBRE’s annual Canadian Market Outlook attended by about 1,400 brokers, developers and landlords at the Toronto Convention Centre on Tuesday. At the same event, CBRE’s executive vice-president Paul Morassutti outlined the unprecedented technological change and unpredictable political landscape that will shape the market in the coming months and years. “Change in every aspect of the market is inevitable, it is accelerated and it is ubiquitous,” he said citing geo-political uncertainty and technological innovation as the over-riding trends in tenant and investor demand for commercial real estate. Morassutti cited the lack of coherent trade and policy positions emerging from the presidency of Donald Trump. Europe remains a question mark. Seventy-one per cent of foreign investment is Chinese and it’s not clear whether that country will find “a policy tourniquet” to stem the flow of capital leaving the country. Some reports are predicting that 47 per cent of jobs — 700 occupations — will be automated as artificial intelligence changes the face of work, he said. But there’s no indication that the appeal of Canadian commercial real estate will decline in the near future, said Morassutti. “Skittish capital is being driven to Canada,” he said, noting that investment activity was at record levels in 2016 with every asset class outperforming its 10-year average. Retail: Online shopping isn’t killing retail, but it is separating the weak from the strong. Virtually every flagship mall in Canada has been expanded or renovated and experiential shopping is on the rise as retailers try and keep shoppers in their stores longer with attractions such as “foodie food halls” and high-tech golf driving ranges. Many retailers are reducing the number and size of their stores and focusing on the best locations. Residential: Affordability and lifestyle considerations are prompting younger Canadians to forgo home ownership just as the baby boomers are getting ready to cash in the equity in their homes and downsize. A recent uptick in purpose-built rental development will increase. “Condos have been the de facto rental in most cities. But there is a growing cohort who would prefer to live in a professionally managed building rather than deal with a condo owner in another country where you have no security and you’re in a building that quite often resembles a frat house,” said Morassutti. Councillors Ana Bailao and Josh Matlow are calling for the province to review the Residential Tenancies Act and look specifically at rent control. A pair of Toronto city councillors are calling on the province to protect tenants from steep rent increases. Coun. Josh Matlow and Coun. Ana Bailão will hold a special joint meeting of the Tenants Issues Committee and Affordable Housing Committee in early April, where they will ask the province to review the Residential Tenancies Act. Most landlords are limited by provincial law in how much they can increase rent each year. But there’s an exemption for buildings built after 1991, where there’s no cap on increases. That’s something Matlow, who chairs the Tenants Issues Committee, calls “unethical” and said creates two classes of tenants. “Their rent can go up by hundreds if not thousands of dollars without any notice, and they’re in a real bind,” he said. Because there are so few rental apartments on the market, one increase can mean tenants, especially young people and seniors, are “forced out of their own communities,” he said. Matlow also wants the province to review the part of the act that deals with above guidelines rent increases for pre-1991 buildings. He says landlords often use basic improvements to buildings to justify rent increases at the Landlord and Tenant Board. The policy was originally introduced in the 1990s to provide an incentive for developers to build rental housing, but Bailão said she is concerned it’s not meeting its original goals. She added that the review must also look at the lack of rental housing supply to understand the bigger picture. She’s worried that if something isn’t done soon, people just won’t be able to live near where they work or study in the city. “These kind of rent increases are not healthy, are not sustainable, and at the end of the day, we’re all going to lose because of it,” she said. “People are struggling to pay rent or buy food,” she said. Renting in Toronto, quite frankly, is tough. Trying to find a place to rent? You can wind up shell-shocked over what a one-bedroom will cost you these days. 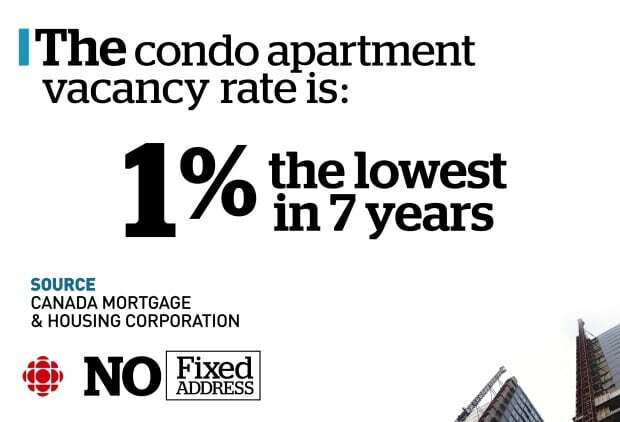 Plus, according to the Canada Mortgage and Housing Corporation’s (CMHC) 2016 data, the condo apartment vacancy rate is at one per cent — the lowest in seven years, the housing agency says. But take solace: everyone else is trying to navigate renting in Toronto, too. In fact, there is a whole group of us on Facebook here. Join, discuss and vent. Whether you are a first-time renter or a veteran of sorts, these are your must-know basics. Of course, this is no substitute for expert advice or additional research. This is roughly what you can expect to pay in the purpose-built rental market, which can include apartment buildings as well as row houses, the CMHC said. What kind of apartment can you get in Toronto for under $1,000? $2,029 for a two-bedroom condo apartment. The CMHC compiles its data by surveying owners, managers and superintendents. What kind of apartment can you get in Toronto for $1,800? Two-bedroom condo apartment is $2,415. 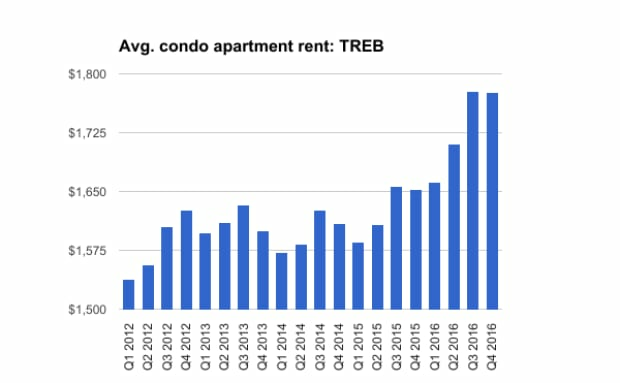 According to TREB’s data, the average one-bedroom condo apartment rent was $1,776 in the fourth quarter of 2016 — an annual increase of 7.4 per cent compared to the fourth quarter of 2015. 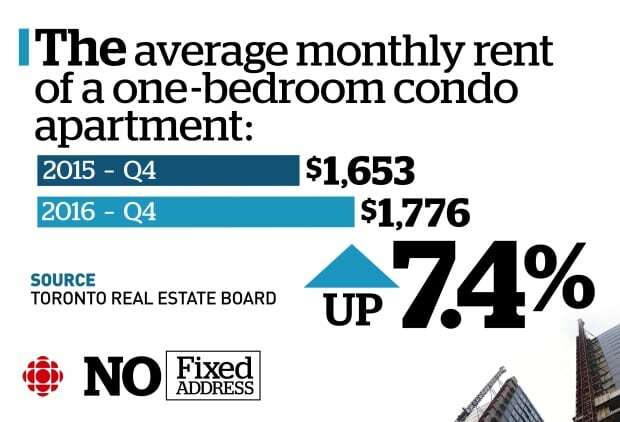 A mere five years ago, a one-bedroom condo apartment would run you $1,626, according to TREB’s data from the fourth quarter of 2012. Do you have a 1-bedroom in stock? If it feels like slim pickings out there, it’s because it is. The vacancy rate for condo apartments — one per cent — is at its lowest in seven years, according to the CMHC. And as TREB noted in its Dec. 2016 report, rental transactions were down during the last three months of 2016 but not because of declining demand. There is simply a lack of units available to rent. The real estate board says the number of condo apartments listed for rent during the fourth quarter of 2016 decreased by more than 14 per cent compared to the fourth quarter of 2015. Congratulations, you found yourself a decent pad. But do you know when your building was built? It matters, greatly. The province sets a guideline for rent increases every year. For 2017, it is 1.5 per cent. But there is a loophole — it only applies to units built before Nov. 1, 1991. So, if you live in a newer rental, you have no protection against an exorbitant rent increase. 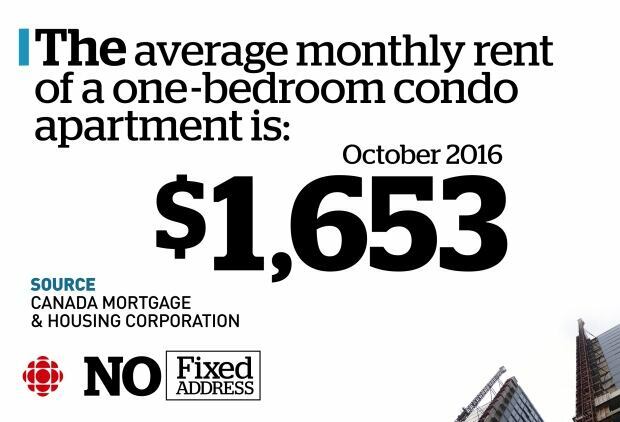 That means your $1,650 monthly rent could balloon to $2,600, an increase similar to the one that forced CBC Toronto reporter Shannon Martin to leave her condo apartment. While there is no limit on how much a landlord can increase your rent in newer buildings, they must give you 90-days notice and your rent can only increase once per year. ‘Fierce’ competition for few units pushes prices higher as hot housing market keeps millennials in rentals. At the end of January, Nicole Meredith got a big, unpleasant surprise. The rent on her one-bedroom condo apartment in Queen West was jumping in just 90 days from $1,275 a month to $1,700 — a $425 spike. “It was totally shocking,” says Meredith, 25. Shocking, sure, but not entirely surprising in Toronto’s pricey, competitive rental market, where a lack of units is pushing prices to new heights as the hot housing market keeps millennials like Meredith renting longer. Open houses and bidding wars are now just part of the game, says real estate agent Dena Schiff, who works solely with clients looking for rentals. “The competition is fierce,” she says, citing the example of a recent listing in the Bay Street and Bloor Street West area for $1,800 a month. You can see the areas of greatest growth in the below image marked in red. Urbanation says 5,000 purpose-built rental units are under construction in Toronto, nowhere near the level required to keep up with demand. For Meredith, who has been renting downtown since she was 18, the crunch might now be too much to handle. “It’s definitely a possibility I won’t be able to afford to live here anymore,” she says. The choice between buying a new independent house and owning a new condo in Toronto would soon be a difficult one. According to Canada’s leading real estate information services company, RealNet Inc., the price difference between a new single-family detached home and a new condo has reached almost $300,000 in February 2015. Another company, BuzzBuzzHome’s information show the average price of a new independent home or townhouse was $733,578 in February, compared with $442,672 for a condo, reflecting a gap of $290,906. This means, the price of a new home has gone up 12 percent from the same period in 2014, but the price of a condo jumped just by one percent. BuzzBuzzHome is known for providing map based search results for all new residential properties. 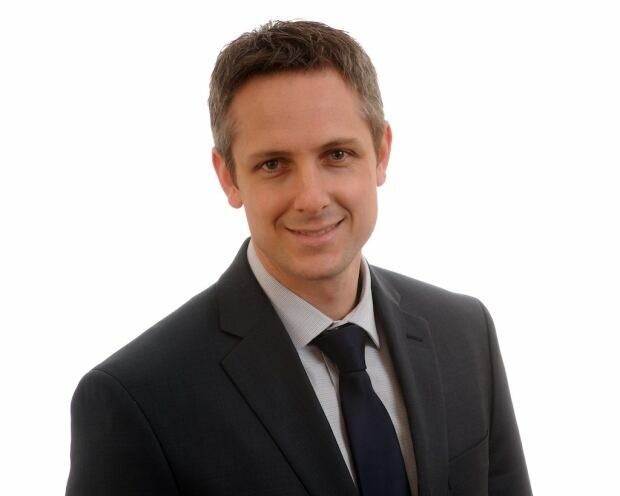 The trend is similar to Vancouver, informed Brendan Pyne, RealNet Canada business development manager. In fact, Toronto is 10 years behind Vancouver when it comes to such kind of price difference in the housing market, he added. The shortage of new land to construct independent houses or townhomes forced many property developers consider high-density developments, resulting in thousands of options for condominiums in the greater Toronto area. Though most of the land is in the 905 areas, it denotes Toronto’s congested suburbs, which is not a preferred address for many. However, the average price of a resale independent property in the 416 area is over a million now — an increase of 8.8 percent from last year, the average price of a resale condo in the same area could be somewhere around $369,655, reflecting a slight decline from 2014. With the current real estate scenario in Toronto, forget owning an independent house with a backyard; the average size of a new condo is just about 800 square feet, at least 125 square feet lesser from 10 years ago. To report problems or to leave feedback about this article, e-mail: barsha23@gmail.com. The gap between the price of new condos and the price of new homes is widening in Toronto, hitting close to $300,000 in February according to RealNet. RealNet figures show the average price of new detached home or townhouse was $733,578 in February, compared with $442,672 for a condo, a difference of $290,906. And while the price of a new home is up 12 per cent from this time last year, the price of a new condo has inched up by just one per cent. There is a limited amount of new land for single-family dwellings, most of it in the 905 area, he said. That’s forced developers to consider high-density development and thousands of new condos are under construction or coming onto the market this year. “I would say the main factor driving the gap in the Greater Toronto Area is green land legislation that restricts the ability to grow outward,” Pyne said. Vancouver ran into the same limits 10 years ago, he added. There is intense demand for both new and resale single-family homes, so much so that Toronto real estate prices have continued climbing, even as real estate markets in other cities begin to slow. The average home price for a detached resale house in the 416 area is now over $1 million and is up 8.8 per cent from a year ago. The average price of a resale condo was much lower at $369,655, a slight decline from last year. For young Toronto families that presents the possibility that they’ll never own a home with a backyard. And while detached and semi-detached homes are out of reach financially, condos may not be big enough for couples with children. The average size of new condos is shrinking and currently stands at about 800 square feet, 125 square feet less than they were 10 years ago.